On Monday, I mounted a show at the Linda Street Gallery in the lobby of the Dovercourt Recreation Centre. 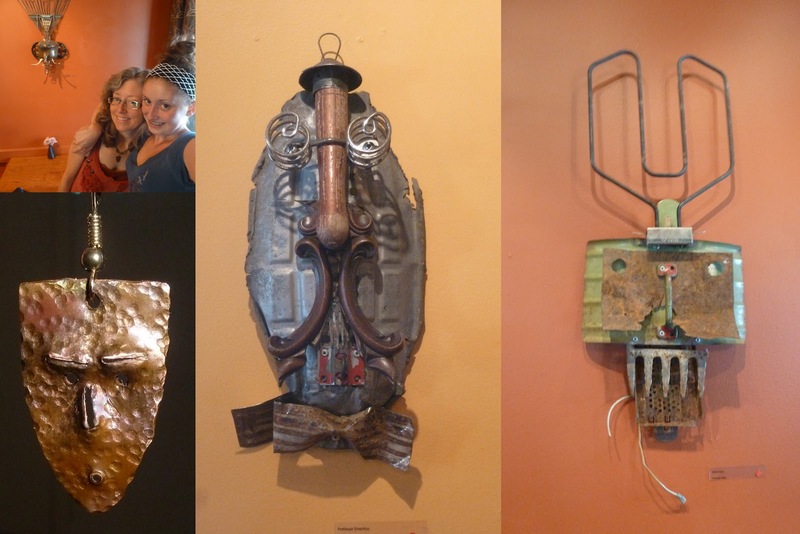 The work consists of assemblages made this past summer while a guest at the Main Street studio thanks to Annette Hegel and Karin Bell. I have also included some of my masks made from found objects. The work will be up for the rest of December. 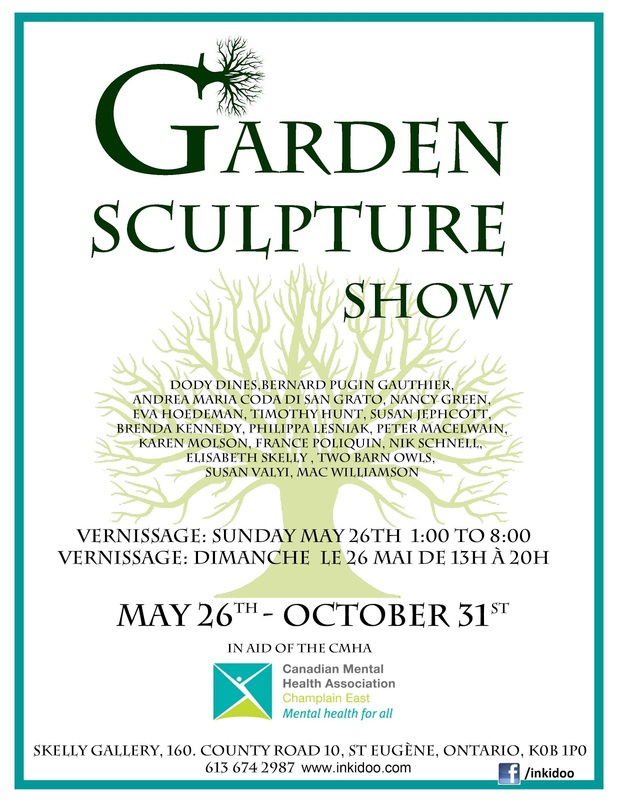 Hope you can come by and see it! 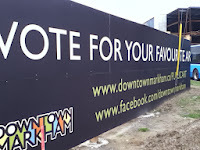 Work in Progress at 88 Main St. 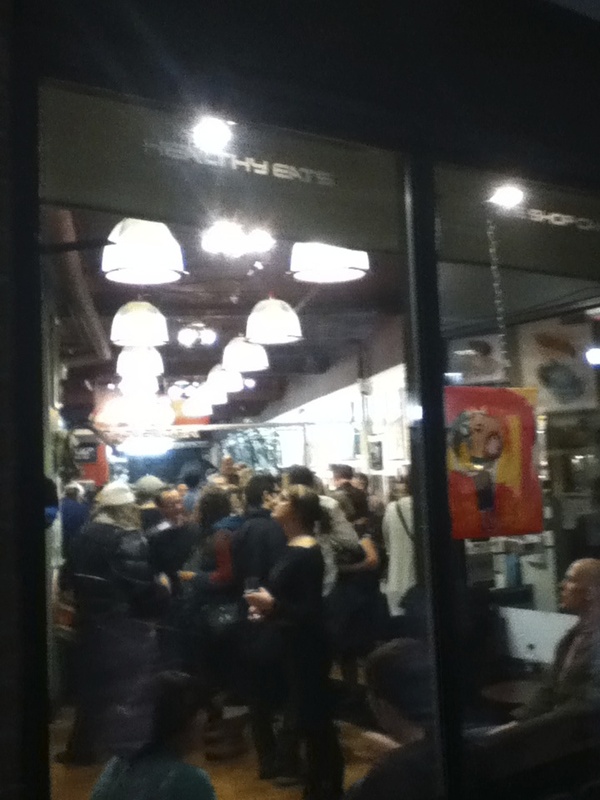 The 7th Annual Holiday Art Show CYCLELOGIK 1111A Wellington W. DECEMBER 5th, 8 pm. Time again for the annual Holiday Art Show at Cyclelogik. This year's theme: Bizarre Love Triangle. 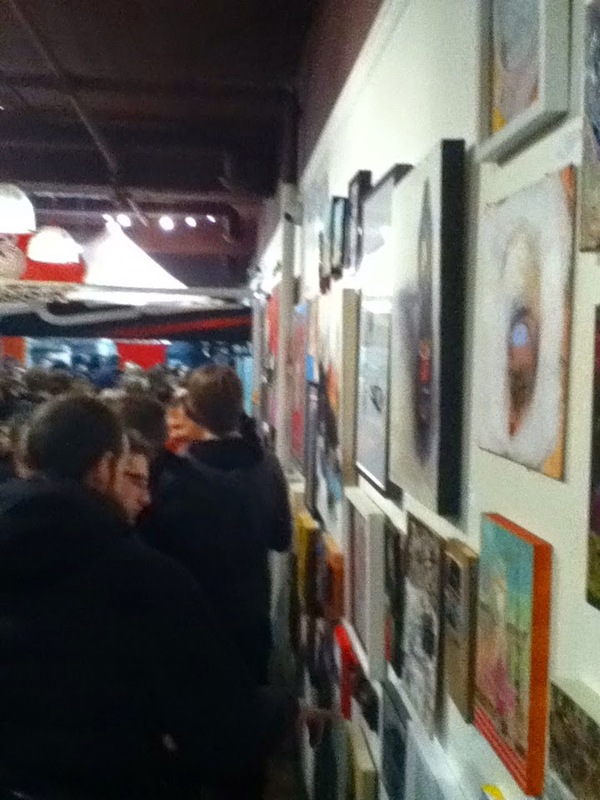 onto the walls of the shop with an incredible array of local talent represented. so these pictures are from the 2013 show entitled "RED". Lots of work, lots of artists, food, drink, come early, have fun, buy local art! 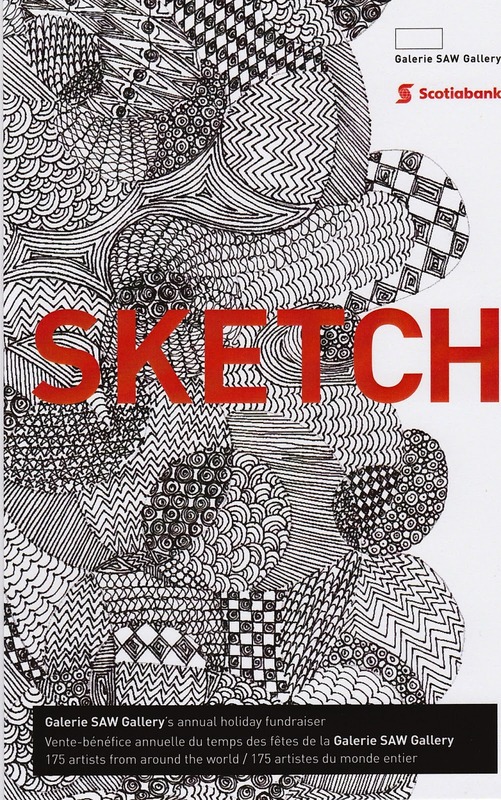 Just packaged this up and delivered it to SAW gallery for this year's annual fundraiser, SKETCH. 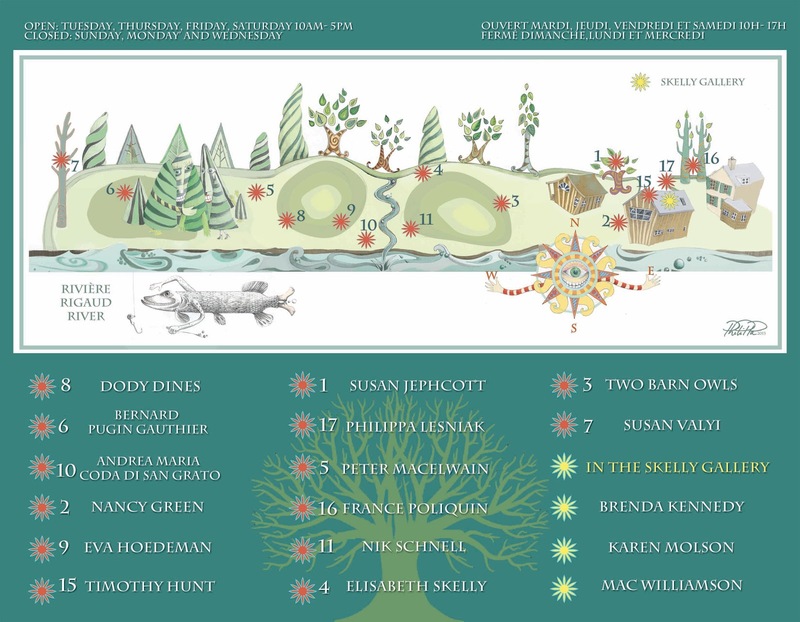 The event is this Friday night and features tons of art for sale, donated by local artists as well as a silent auction with work from notable and international artists. All the pertinent info is listed below. Hope to see you there! 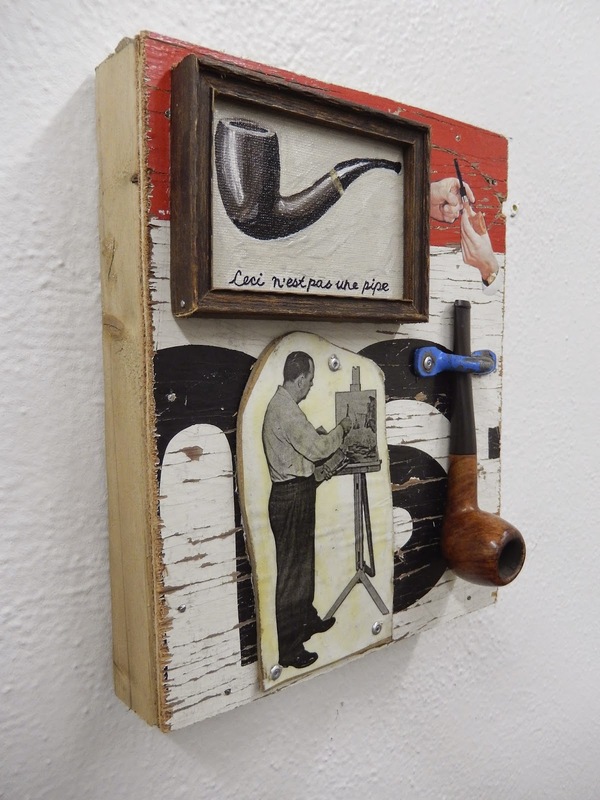 Artists Timothy Hunt and Katie Argyle have forged a longtime friendship based on the exchange of art and ideas in many manifestations including mail art, one page books, collages, off-beat stories and poems, even light-based outdoor sculpture. Now, hundreds of kilometres apart, they continue to inspire, instigate and irritate one another into a state that results in inevitable creative output. 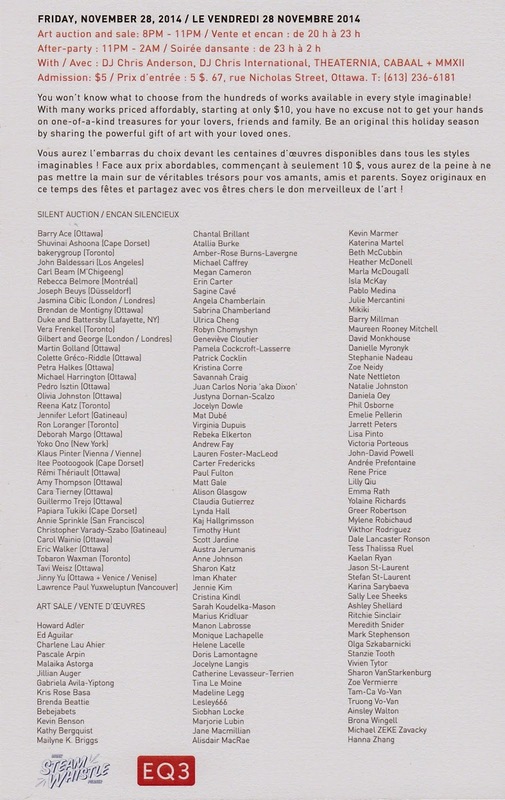 50/50, Against the Grain, brings together the artists' unique reflections on a half century of life. This time they are both using the medium of wood and the results cannot help but go against the grain. We've Created a Monster is a playful exhibition of fictional and everyday monsters put together by myself and long-time artist/friend Katie Argyle. 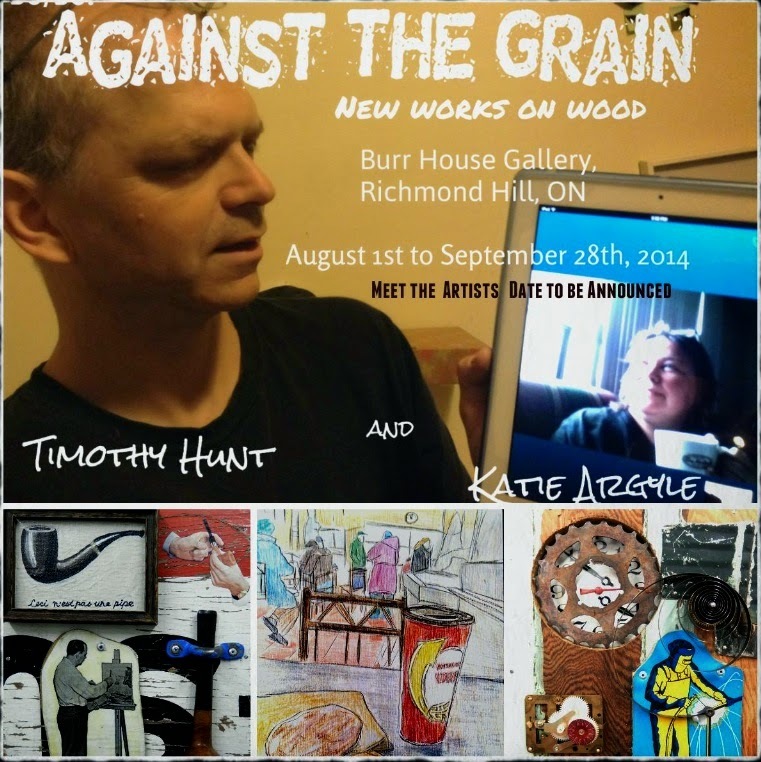 We've Created a Monster ran for August and September at the Burr House Gallery in Richmond Hill. It can be seen in it's latest incarnation at The Linda Street Gallery in the Lobby of Dovercourt Recreation Centre, 411 Dovercourt St., Ottawa for the month of October. The show will be taken down on October 30th to make way for the Community Centre's annual Halloween extravaganza featuring the ever popular haunted house, engineered by students of Carleton University. It was a great privilege to visit Katie at her new home in Richmond Hill when we took down the show, and to see evidence of her creative exploits all over the region. 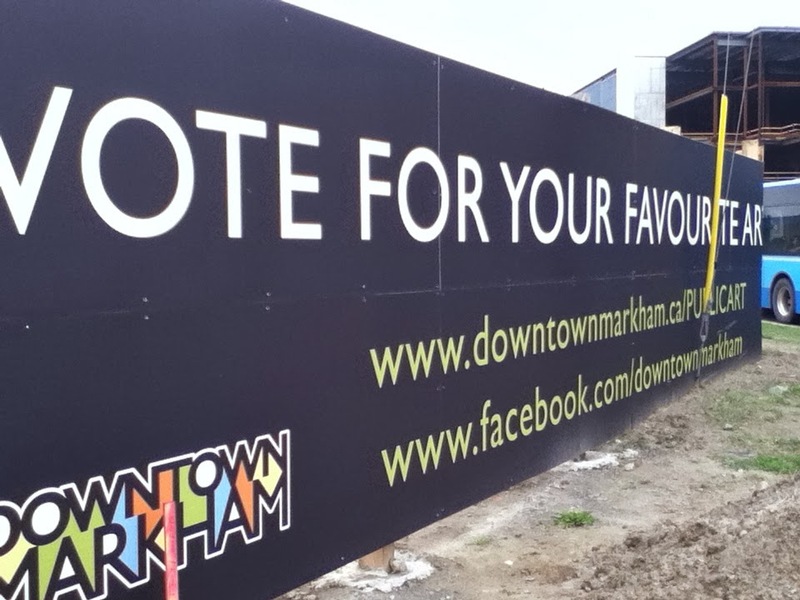 Take a minute to vote for her mural in Downtown Markham's Perfect City competition! Here's a sneak peak at the sculpture I am donating for tonight's silent Auction at the Ottawa Velo Vogue Fashion show at Kichesippi Brewery. Details below. Hope to see you there! I will be donating a mask for the silent auction. 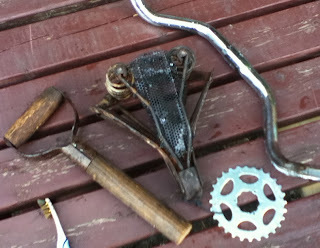 Here's a sneak peek at some of the elements scrubbed up and ready to assemble. 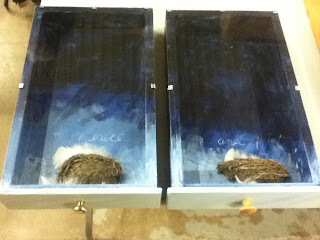 I'll post a photo of the completed work tomorrow. I just took down my show at the Urban Pear on the weekend and sent off two of my masks, Longhorn and Appearing Knightly with my artist friend Nancy Green to the Skelly Gallery for the upcoming Garden Sulpture Show in aid of the Canadian Mental Health Association. 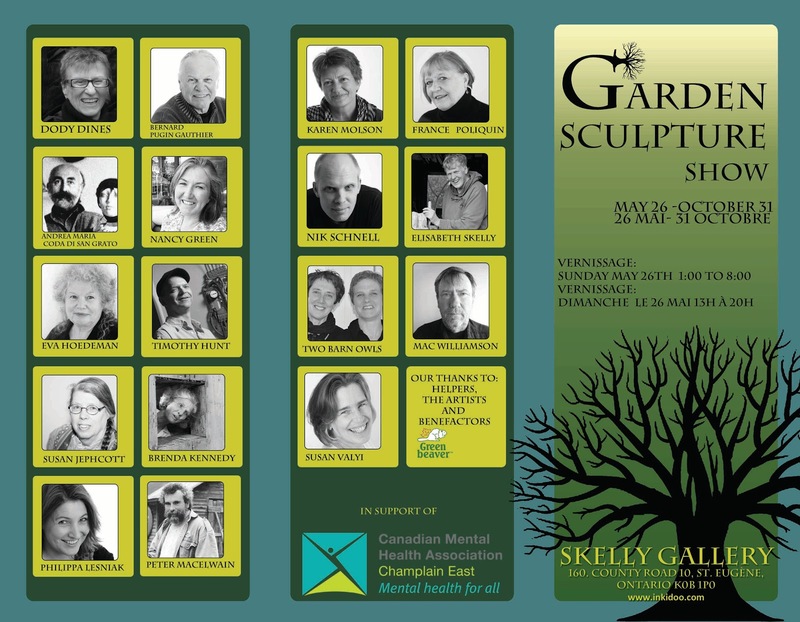 I'm a big fan of outdoor art and am really looking forward to visiting Skelly, and checking out the other artists work. I set up my show at the Urban Pear this morning with Chef and owner Ben Baird (twitter). I was welcomed by delicious coffee and was very interested to hear about the food truck the Pear is getting ready to hit the streets in May. You are in for a treat ottawa! It's very satisfying to see work go up on the walls of such a fine establishment after working away in the studio surrounded by piles of scrap metal. I feel like a groundhog crawling out of my hole. 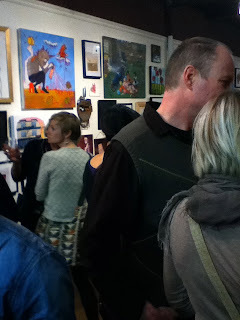 That said, the exhibit looks great in these surroundings, so check out the Pear's website for it's hours and other info. A big thanks to Annette Hegel for her generosity in allowing me to use space in her studio for the past few months. I tend to do most of my work outside during the friendlier seasons, so the warmth of an indoor workspace was comfort indeed!. 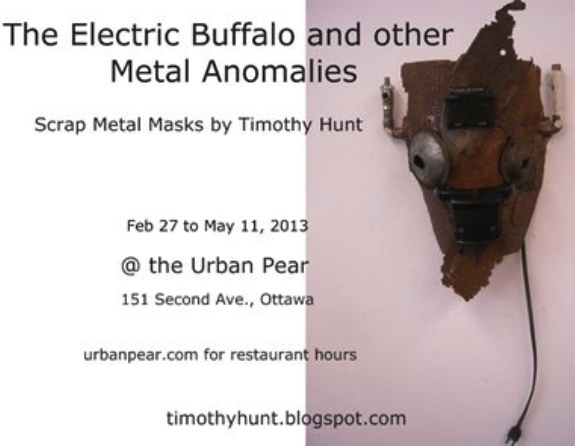 The Urban Pear is closed Monday and Tuesday so the show will start on Wednesday Feb. 27 and runs until May11th. 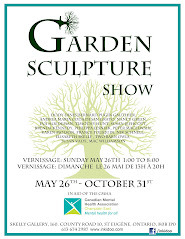 Come on by and check out the show and while you're at it have a look at the menu. Awesome! 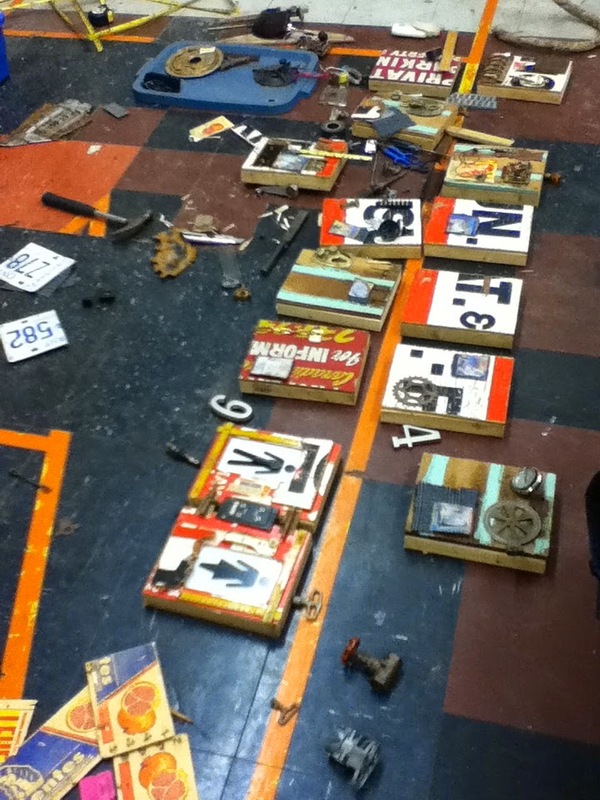 Black Box Collage 2013, No. 2. 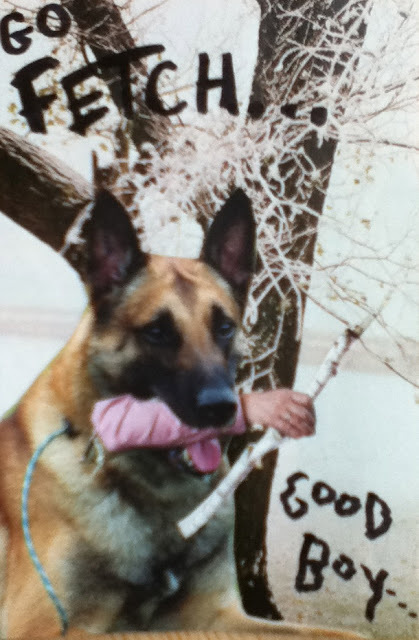 Fetch! 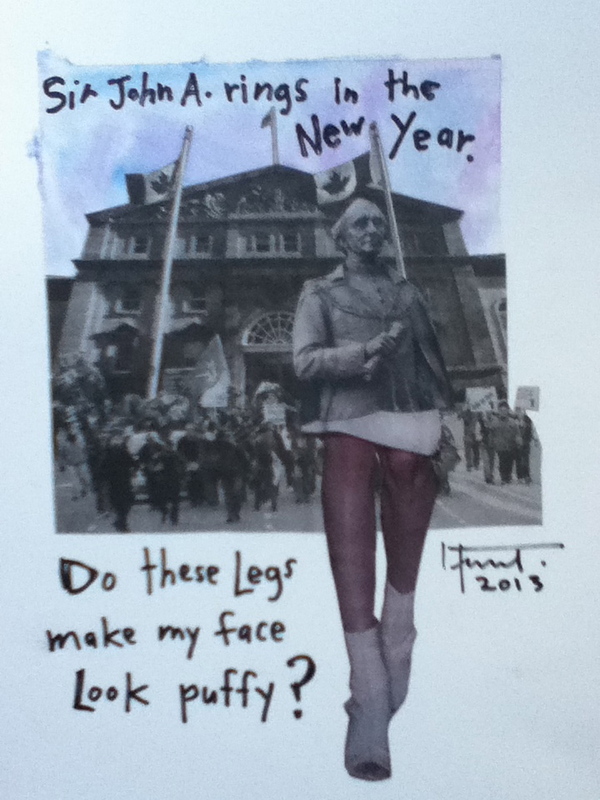 Black Box Collage 2013: #1 Sir John A. rings in the new year! Happy New Year!!! If you haven't had a chance to stop by Cyclelogik, Sweat-er continues until January 7th. Thanks to Andrea Stokes and the folks at Cyclelogik for hosting a great opening in December. Holiday Sweat-er at Cyclogik, Friday Dec. 7 !!! Yes, it is that time of year already! 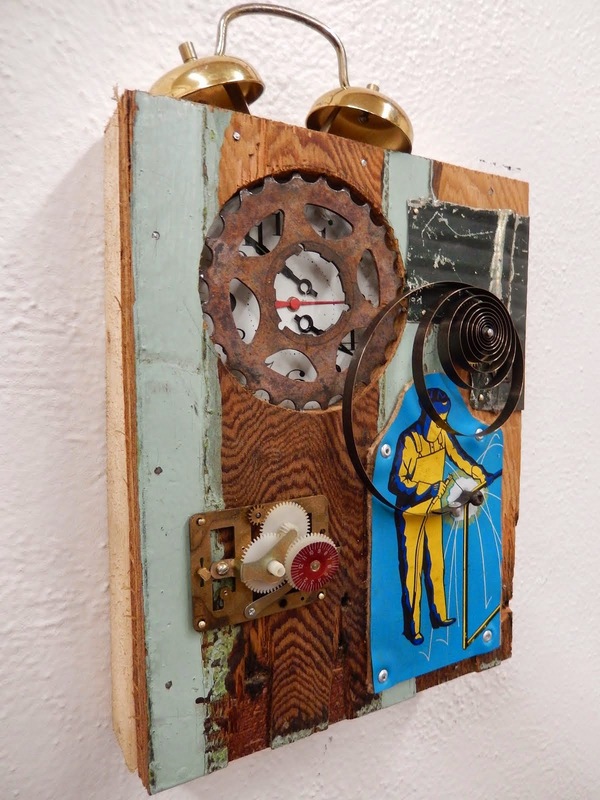 On thursday the kind folks at Cyclelogik will be clearing space on the walls of their shop for the annual art show curated by none other than artist and self-described art-pusher, Andrea Stokes. The opening takes place Friday night and the place is always packed to the rafters (I'm not kidding), so come early and get your Christmas shopping done. Over 40 of this city's intriguing artists are represented with small and medium sized works for every collectors budget. Art, bikes and coffee--an unbeatable combo. See you there! December 1st? How did that happen? What better way to usher in the final month of the year, than with blistering cold and a trip to the Habitat for Humanity ReStore? Drop off donations for Habitat for Humanity, buy a storm door, drink some coffee and talk to a local artist! At today's art event, dubbed Refab I (artists showing work with reclaimed materials in a recycling environment) , I was joined by two fabulous interdisciplinary art-friends, Annette Hegel, and Nancy Green. I was privileged to spend the day exchanging stories and ideas with these engaging and inspirational folk. 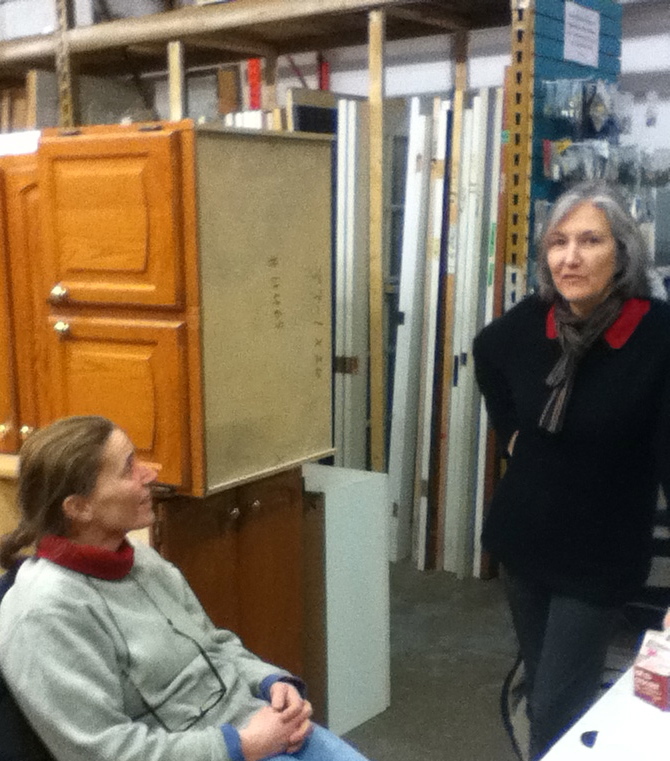 Annette Hegel, a local and international art activist who has done everything (no, really!) , brought intriguing pieces combining miniature figures with reclaimed objects to create arresting environments that challenge ones sense of scale while drawing in political themes. In Watching the fireworks, tiny white figures sit watching Gaza burning from their perch on a chunk of rusted steel. 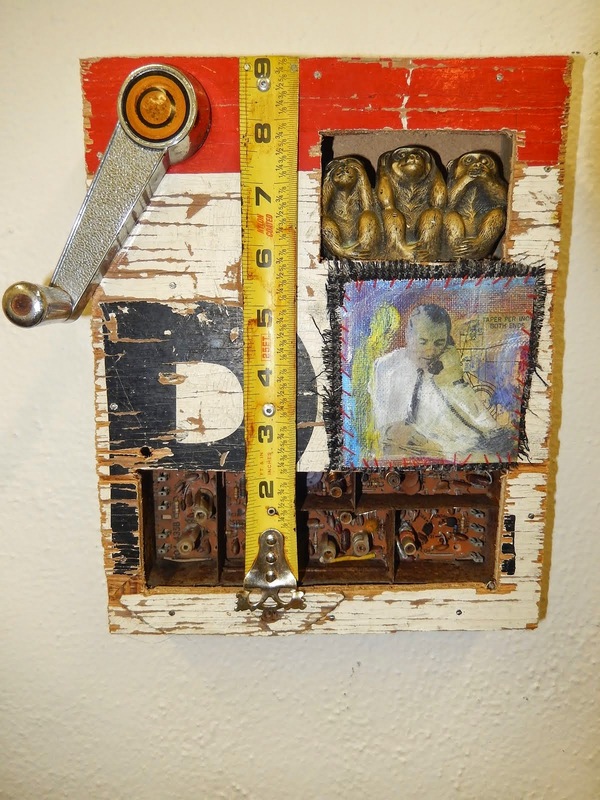 Nancy Green, whose show, Variable Change at Zen Kitchen runs until the end of December, is exceedingly resourceful at combining found objects in smart compositions and shows remarkable facility with paint, ceramics and metal while maintaining an art of delicacy. The work Nancy brought to the show included paintings on off cuts of plastered doors, glassed in drawers with birds nests and framed antique bottles with subtle text punched into copper strapping. 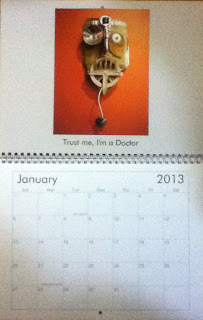 I brought a selection of current junk masks, and debuted my 2013 photo calendar. Thanks to Myrna and the Gang at the ReStore for their hospitality and remember, you can now bring your e-waste to either NCR location anytime. Look out for Refab II, coming in the new year! I arrived at the Habitat for Humanity ReStore on Saturday morning in the pouring rain, so the planned outside set-up for my work was definitely not going to happen. After years of being bullied by the weather at outdoor markets, craft fairs and art shows I was very content with the contingency plan of setting up inside the warm dry store with the big vat-o-coffee and great abundance of brownies. It was a great pleasure to meet Myrna and the welcoming staff and have the leisure of setting up my masks here and there throughout the store. The masks were right at home alongside the building materials, fittings, hardware supplies and other miscellaneous items that can be found at the ReStore. After setting up, it wasn't long before I was rooting through bins like a kid in a candy store and making a little pile of things to take home myself! While the rain continued to keep the hoards away, I contented myself, tinkering with an old typewriter that I was determined to take home with me, and which Myrna ended up giving to me as gift for coming to the store--I couldn't be happier! More and more people appeared as the day moved along, and despite the rain I talked to a lot of interesting folks and lots of drop-offs were made to the E-waste site. BTW, I believe that both ReStore's in Ottawa are now accepting E-waste for recycling on a regular basis (check their website). I was also pleased to meet Stone Sculptor, Uwe Foehring, who is on Staff and also is the creator of the towering e-waste sculpture outside the store. Thanks again to Myrna for the invite. I met some great people, found a new source for art materials, oh ya, I sold some artwork as well! NCR Habitat for Humanity ReStore, Saturday Sept. 8, 9 am. to 5 pm. I just took down my work at Zen Kitchen and will be delivering the rest of the sold artwork in the next week. I was thrilled to get a call from Myrna at the ReStore, inviting me to show my work as a part of their launch for a new e-waste drop off site. On Saturday, weather permitting, I'll be setting up a display of artwork from my Tribal Masks of Urban Culture outside the store. If it rains, I'll be it inside. 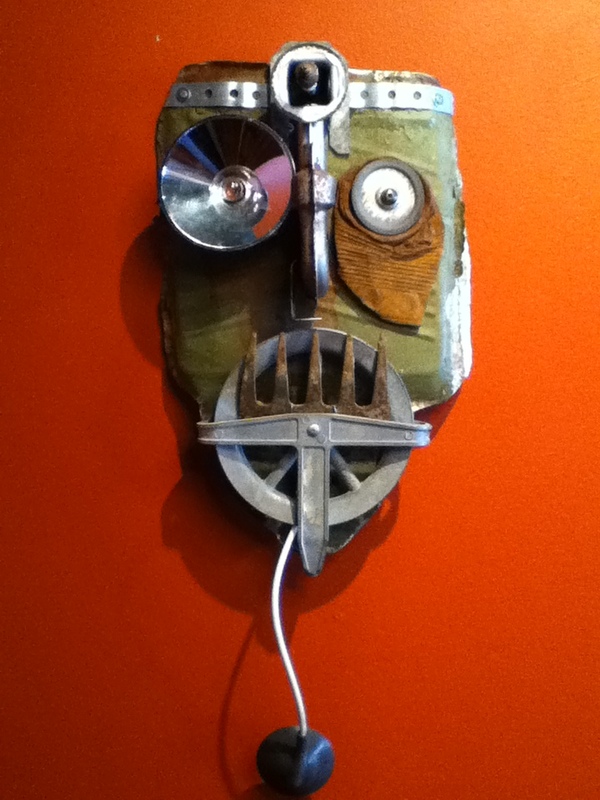 Come by and bring your old plug-in thingys that don't work (we all have them) and make room for some...art? The NCR Habitat for Humanity ReStore is located at 7 Enterprise Ave. (Off Merivale Rd. in Ottawa). Earlier this month I had an email from Heather Boyd, an old friend and fellow street-vendor of Karen's and mine from Montreal days. Heather had lunch and visited my show at Zen Kitchen with her daughter. 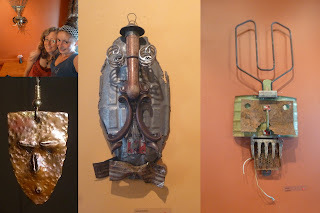 She made this photo-collage of two masks in the show and wore this mask earring on a necklace (bottom left) that I made in 1989! I used to cut up old copper plumbing pipes, heat them with a torch, flatten them out and pound designs into them. The first ones I made were pretty heavy, which probably explains why it is now on a necklace! I didn't even realize until later that I could buy copper sheets that were already shiny and flat. 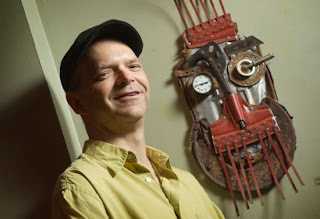 I had forgotten that I was making masks from "junk" all those years ago. Thanks Heather! Heather Boyd is a multi-talented artist who has been making fantastic wire jewelry for years and is fast becoming a you-tube sensation with her instructional arts and craft videos. Check it out! 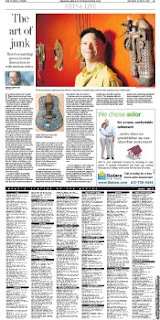 Peter Simpson did a review on my show at Zen Kichen for the Ottawa Citizen (thanks Peter! ), which first appeared online on his blog Big Beat, and the following week in the print edition of the paper. Note that the show will run until the end of August. Also reviewed in the article are two other artists you must check out : the always interesting Marc Adornato, with 3 simultaneous shows at Shanghai Restaurant , the Daily Grind, and the Hintonburg Public House; and John Sekerka with a collection of playable art guitars at Gigspace. Zen Kitchen is now on Google Street View Interiors and as a happy coincidence the Google camera people came just after my show was mounted. 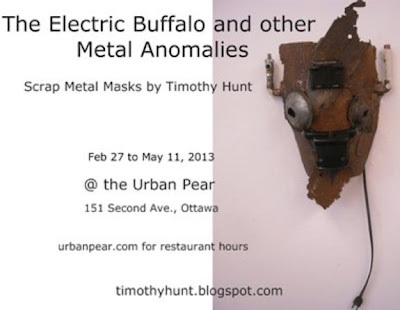 Now you can take a virtual walk on Street View and walk right into the restaurant to see Tribal Masks of Urban Culture. If you click on the little man icon in the corner of the picture on the google maps page, you can "look inside" the restaurant, pan 360 degrees and zoom in on some of the artwork. Of Course a Google visit is no substitute for the real thing, so if you want to get a really good look at the artwork and more than a virtual taste of the fine cuisine you'll have to drop by Zen Kitchen!! !